Some Apple II computers can daisy-chain disk drives: connect multiple disks, one after another in a single chain. I’m exploring options for the BMOW Floppy Emu disk emulator to support daisy-chaining more flexibly than it does now. I’d love your thoughts on whether you’d find this personally useful – please read below and leave a note in the comments section. Daisy-chaining makes it possible to connect many different disk drives to the same computer, without needing a separate disk controller card for each drive. Among early Apple computers, only the Apple II family has daisy-chaining capability – the Macintosh and Lisa don’t support it. Even among Apple IIs, daisy-chaining is only very useful on the Apple IIgs, the rare Apple IIc+, and to a lesser extent the Apple IIc. Other Apple II models lack the necessary hardware or the ability to control multiple types of drives, so this discussion will focus on the IIgs. At most two drives of each type can be placed in the chain, six drives in total. A critical requirement is the ordering of drives in the daisy chain: the dumb 3.5 inch drives must appear before the smart drives, which must appear before the 5.25 inch drives. This requirement stems from the way the disk port’s control signals are multi-purposed to serve several different types of drives, where some types didn’t yet exist when the older types were designed. You can try physically connecting the drives in a different order, but some of them won’t work and may even be damaged. The ordering requirements have the side-effect of constraining the computer’s options for boot disks. With complex daisy chains, these constraints can become inconvenient and annoying. Dumb 3.5 inch drives and smart drives are placed in a single logical group that’s mapped to slot 5. Only the first drive in that group can be used as a slot 5 boot drive. If two dumb 3.5 inch drives are connected, only the first can be used to boot the computer. And if both a dumb 3.5 inch drive and a smart drive are connected, only the 3.5 inch drive can be used to boot the computer. The smart drive can never serve as a boot drive, in this case. Floppy Emu in Smartport HD emulation mode, combined with one or two 5.25 inch drives. Floppy Emu in 3.5 inch emulation mode, combined with one or two 5.25 inch drives. Floppy Emu in 3.5 inch emulation mode, combined with another 3.5 inch drive, where Floppy Emu serves at the first (boot) drive. Floppy Emu in 5.25 inch emulation mode, combined with another 5.25 inch drive, where Floppy Emu serves at the first (boot) drive. Giving a daisy chain output to the Floppy Emu would enable all of the above setups. Unfortunately it would also add more complexity to the device, because the daisy chain output isn’t simply another physical connector with its data signals bussed from the daisy chain in. It’s a complex logic device whose behavior must change depending on what type of drive is being emulated, whether that drive is currently enabled by the computer, and what type of drive (if any) appears next in the daisy chain. Depending on the circumstances it must alternately cross-over, gate, or otherwise modify the disk control signals. This would require a new programmable logic device, likely a small CPLD similar to the one Floppy Emu uses for disk emulation. But the added cost and complexity would be little benefit to anyone except Apple IIgs owners. I’ve been exploring a different route – a stand-alone daisy chain adapter rather than a modification to the Floppy Emu. This adapter would function like a T splitter, taking Floppy Emu’s place in the daisy chain, with a connection for the Floppy Emu as well as a standard daisy chain output for additional drives. This would provide a daisy chaining option for Floppy Emu owners who want one, without negatively impacting anything else. Note there’s still one Apple IIgs setup that can’t be supported: Floppy Emu in Smartport HD emulation mode, combined with another 3.5 inch drive, where Floppy Emu serves as the boot drive. The Apple II drive ordering and boot requirements make this combination impossible, as described earlier (except for some very awkward work-arounds). This has nothing to do with the Floppy Emu or its lack of a daisy chain output – the same limitation exists with other 3.5 inch and smart drives. My question to you, Apple II reader, is whether a stand-alone daisy chain adapter would interest you for enabling the Apple IIgs daisy chain setups listed above. It would be clearly a niche item for a niche product, so I’m unsure if it makes sense. Aside from the cost of manufacturing and possible low demand for this adapter, the biggest hurdle would be finding a supply of female DB-19 connectors for the daisy chain output. This could be a major challenge. When the global supply of male DB-19 connectors was exhausted a few years ago, I had to commission the manufacturing of 10,000 new ones to continue with Floppy Emu production. That was very expensive, and I definitely can’t afford to do something like that here. Hopefully enough DB-19F’s are still in a surplus parts warehouse somewhere! John Keoni Morris (https://twitter.com/DiskBlitz) bought up a bunch of female DB-19s for his Applesauce project. Time to make an order of 10,000 of them to split with him? I have an Apple IIGS with the Floppy Emu. I get it that I’m in the minority. However, I would be interested in a stand-alone chain adapter. I\’m also a IIgs / Floppy Emu owner. Assuming the price was somewhere around the Floppy Emu I\’d buy a standalone daisy chain adapter, if only for the potential flexibility that it could provide down the road. It’s hard to predict a price for something I haven’t actually built, but I’d hope it could be $40 or less. The biggest problem is the DB-19 female, which now looks like it’s as dead as the DB-19 male was a few years ago. I can’t think of any obvious way to make a substitute. Manufacturing more DB-19 females is one option, but it would likely cost over $10,000 including the cost of new molds. We would need to organize a large group buy of people who care enough about the DB-19F to pay $1000+ per person to see it done. Or we’d need an even larger group of Apple/Atari/NeXT collectors who’d donate small amounts toward the cause, in the name of “historic preservation” of the DB-19F. Hi Steve. I got it installed and it is working fine. I have a request for an improvement that would make it perfect. I have the A/B Disk Switch 1.1 that I could use with this to switch between the floppy emu and my external drive. However, the A/B switch has only ribbon cable connectors and not the female DB-15 connector, so I would need an adapter. That is very messy. What I would propose is for the external piece of the Apple IIc switcher, build in the A/B disk switch and have two switches on it, a ribbon connector for connecting the Floppy Emu, and a female DB-15 connector for connecting an external drive. The switch closest to the computer would be the Apple IIc switch, and the switch closest to the external drive DB-15 connector would be to switch between the DB-15 and the ribbon connector. Then I could hook everything up without a bunch of ribbon connectors and adapters. Also, with the existing Apple IIc connector, the switch is backwards from how I would prefer it. I would rather switch it toward the computer if the internal drive is used, and toward the ribbon connector if the floppy emu is used. There would be no need for the X and || labels in that case, but you could still put them there. I’d love to see a pass-through, my preferred use of a floppy emu is as a boot device which makes it hard to attach anything else as a secondary. Hi Steve, count me in as one of the IIgs (and IIc plus) owners who would be very interested in a daisy chain adapter for my FloppyEmu devices. Also, with respect to the problem of sourcing DB-19 female connectors I would also be interested in helping to finance a production run. Any chance that any of the people who joined you a couple of years ago when you made the male connectors helping with the female ones as well? I am serious about this offer and have the financial resources to assist. Thanks Stavros. 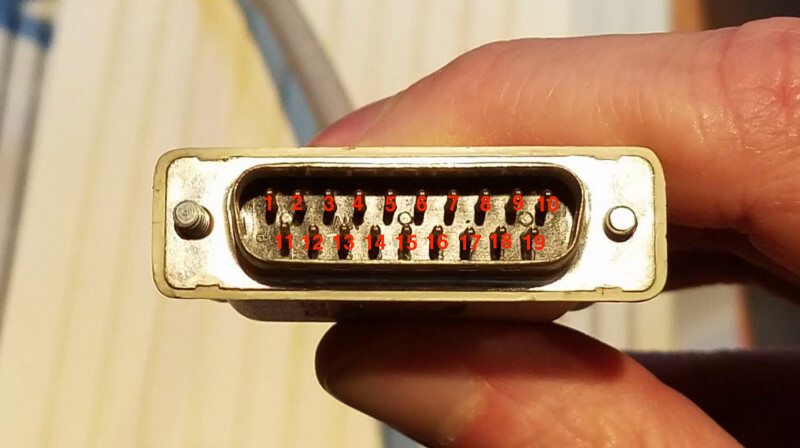 I was able to find 50 DB-19 female connectors – enough to build a test batch, perhaps. If you want to discuss it further, you can email me directly (use the Contact link at upper-right). I am still mulling whether manufacturing new DB-19 female connectors would make sense, but unfortunately it probably does not. The molds for the DB-19 male cost $10,000, and I assume DB-19 female would be similar. So we would need to find enough people who care about getting DB-19F’s manufactured that they’re willing to put $1000 or more each towards it. After the molds, the actual per unit cost is probably under $0.50/each, but there’s a minimum order quantity of 10,000 parts. That maybe could be haggled down to 5000 parts, but that still wouldn’t reduce the total cost very much. For the DB-19 male, I REALLY needed those parts, or the Floppy Emu was going to be dead. So I was willing to put a lot of money and time into it. For the DB-19 female, having them would enable this interesting accessory, but isn’t really a must-have for me. I could imagine making a few thousand dollars in lifetime profit off a daisy-chain accessory, so whatever money I spent towards DB-19F manufacture would definitely need to be less than that. For the DB-19 male, there were five parties in the group buy. Iec.net paid half the total cost and took half the supply. We could see if they’d want to go in the female purchase, but I think the guy I was dealing with there may have retired. Another 20% went to a mix of NeXT and Atari vendors. We could also solicit outright donations from Apple II and Mac collectors, who might send a few dollars just for “historic preservation”. But $10K – $15K is a lot of money to raise, unless most of it is already spoken for by a few large buyers. I\’d buy one for my GS if you make some. I’ve decided to move ahead with finishing the design and building a prototype, just because I think this is an interesting project. But the potential for making them available to other people is still questionable, with no easy source of DB-19 female connectors. You’re true. Thank you for your support on this item. Out of curiosity, I wonder how practical it is to buy the pins from a crimp and poke connector and dump them into a plastic 3d printed DB15 Female? It\’d be a premium for sure, but I\’m not sure how bad. And you wouldn\’t have to commit to a big run of them either. Have you looked into getting a “Go Fund Me” account? I here about them on the TV News stations a lot. Maybe you could raise funds for each or all of your projects via many or one such account, respectively. My ideas are often hair-brained, over-engineered, and hyper-complicated, but for the sake of spit-balling…here goes! How about a major re-design to the Emu and design of the daisy-adapter to accommodate mounting both in a vintage Apple 3.5” or Unidisk case? They’re reasonably priced and seem in decent supply on eBay, and would give you the external cabling and db19 connectors already built-in.